Burgundy and Champagne fought for the life of King Louis XIV. His doctors first told him he should drink only Champagne, but Burgundian doctors conspired with the king's mistress to get a new diagnosis, that he should drink only Burgundy. For more than a century, two of the three best wine regions in France fought a vicious war of words, calling each other's wine unhealthy. Only when Champagne fully committed to sparkling wine did this wine war end. Today, red wines from Champagne are so obscure that I've never seen one on a wine list. But Burgundy makes plenty of sparkling wine: Boisset alone makes more than 10 million bottles a year at Maison Louis Bouillot. However, Champagne-Burgundy hostilities are unlikely to restart because everyone accepts that Champagne is the best place for bubblies -- if you spend enough money. However, in the daily-use price range, Burgundy is a better bet. It's hard to find any bottle of Champagne for under $30, much less a good one, while good bottles of Crémant de Bourgogne can be had as cheaply as $12. But it's tough trying to sell sparkling wine in the shadow of the world's greatest source of it. "People abroad do not know Crémant de Bourgogne," says Agnès Vitteaut, owner of Sarl Vitteaut-Alberti. "The reference is Champagne. So our job is to prove our wine is as good as Champagne. It's difficult even in France. Maybe Champagne is the wrong reference point. I'd rather drink Crémant de Bourgogne than Prosecco or Cava, its main price competitors. Burgundy has a huge advantage over other affordable sparkling wine regions: it grows the same grapes as Champagne, Chardonnay and Pinot Noir. On the downside, grapes from the best vineyards in Burgundy go into still wines. This more than anything else puts a glass ceiling on Crémant de Bourgogne. I'll bet some of the Grand Cru vineyards in Chablis could make 95+-point bubblies if they wanted to, but they get more money making Grand Cru Chablis. I spent a morning tasting Crémant de Bourgognes that are available in the US and chatting with winemakers about them. Here were my favorites. Maison Albert Sounit "Chataigner" Crémant de Bourgogne rosé (imported by Ansonia): Lovers of heritage grapes should seek this out as it's made with about 40% Pinot Beurot, a cousin of Pinot Gris that is no longer allowed to be planted in Burgundy. "It's very aromatic, and it allows the wines to be expressive, says company manager Anne Mourllion. She says Pinot Beurot was commonly used in blends of the 19th century but has all but disappeared. But her company has a vineyard with 50-60 year old vines where Pinot Beurot is interspersed with Pinot Noir. They harvest at the same time and ferment them all together. The wine has a noticeable floral, herbal nose. It opens with light strawberry and finishes with floral notes. Mourllion says when it's time to replant the vineyard, the company will look to Alsace for some Pinot Beurot grapes and try to get special authorization to use them. I asked why the wine is called "chataigner," which means oak tree. I expected it to be oaky, but it's not at all. "It has nothing to do with the wine," Mourllion says. "We have a big oak tree in the plot. It's bothering us; if you want to drive a tractor, you have to go around it. But it looks nice." 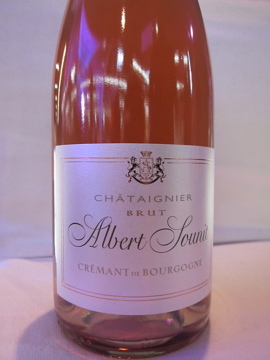 I also liked Maison Albert Sounit Crémant de Bourgogne, the simple entry-level wine, for its bright lemon fruit and good acidity. Maison Louis Bouillot "Perle d'Ivoire" Crémant de Bourgogne blanc de blancs and Maison Louis Bouillot "Perle d'Or" Crémant de Bourgogne 2007 rosé: You'd expect the region's largest sparkling winemaker to have some good wines in its portfolio. The Perle d'Ivoire spends three years on the lees before disgorgment, amazing treatment for a wine I can find online for under $15. Its earthy nose with hints of pepper add gravitas to a palate of bright lemon fruit. The rosé, made entirely from Pinot Noir, has an earthy, mushroomy nose like a still wine, and elegant mouthfeel and a nice finish with plenty of strawberry on the finish. Enologist Frédéric Brand is from Champagne, and has been working at Louis Bouillot for three years. I asked the obvious question: What's the main difference between Burgundy and Champagne? His answer was part obvious and part not: "The terroir and the grape varieties, because we use Aligoté and Gamay along with Chardonnay and Pinot Noir. We also press a little bit more than Champagne." 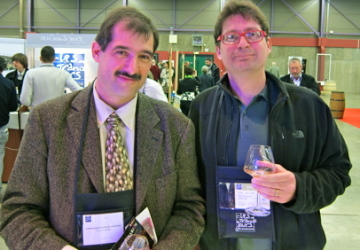 About 70% of Louis Bouillot's portfolio is made by the Charmat method, essentially carbonation, but those wines are sold very cheaply in France; the wines exported to the US are made by the traditional secondary-fermentation-in-bottle method. 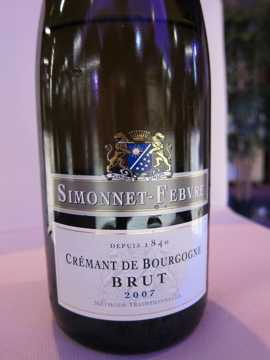 Simmonet-Febvre Crémant de Bourgogne Brut 2007: This is another large winery, owned by Louis Latour, but this is a high-end wine for them. It's only made in years when the winery believes the conditions are good for sparkling wine grapes: '05, '07, '08 and '10. In '08 Simmonet-Febvre actually made two cuvées, one from Chardonnay and Pinot Noir, but those are still in the bottle. This wine is 100% Pinot Noir and I'd compare it to vintage Champagne because, unusually for Crémant de Bourgogne, it has a fairly minerally nose. The fruit is juicy and peachy, and there's just a hint of Sherry on the finish. Wish I'd spent an evening with it. 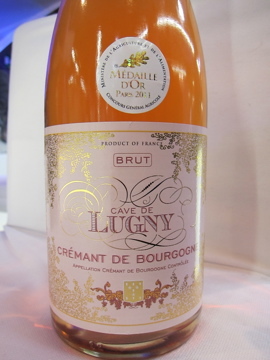 Caves de Lugny Crémant de Bourgogne rosé (imported by Pasternak): I'd drink the heck out of this wine with a mushroomy nose, cheerful strawberry fruit and an earthy finish. Maison TMF Crémant de Bourgogne Cuvée F Argent and Maison TMF Crémant de Bourgogne "Les Bulles d'Or" rosé: The argent (silver) reminds me of some grower Champagnes with its earthiness, though there's also plenty of lemon fruit. The rosé is delightful, with light strawberry fruit that's just a pleasure to drink. At last night's dinner, I was unexcited about getting beef bourguignon, probably the best-known dish from Burgundy. I never order it in the US because I find it heavy and boring. The version I was served at Le Comptoir des Tontons was far more vinegary and acidic than I'd ever experienced. Now I realize American versions of the dish I'd had before had softened that sharpness with too much sour cream, and probably used less acidic wines as the base to begin with. Good food writing requires enthusiasm, and I probably should rave about how great the dish was. In fact, it's still not my favorite; I'd rather eat a nice piece of meat expertly grilled. 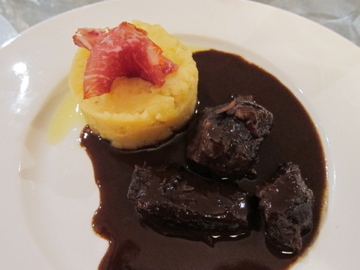 But it was eye-opening to know that I formed my judgment of beef bourguignon based entirely on a few experiences with what were essentially false versions made for the American palate. Think how that applies to Chardonnay and Pinot Noir. Are you getting sloppy or is their no Pinot Meunier in Cremant de Bourgogne, especially the Rose? Ernie: I'm sorry, did I say there was no Pinot Meunier in Cremant de Bourgogne? None of the wineries I spoke to yesterday mentioned it, but one does use a grape I hadn't heard of, Pinot Beurot, so I'm not betting against anything with Pinot in the name. Fun post, Blake! Since I tasted my first sample several years ago, I’ve contended that Bouillot’s basic NV is the best $12 sparkling wine in the world. “Charmat method, essentially carbonation…” I think that’s selling the alternate process very short. Charmat is second fermentation in tank instead of bottle, resulting in much better bubbles than the injection method. Kent: Fair point about Charmat, but it's still just not the same as the traditional method. You mention Champagne region red wines. I ran a quick Google search and found nothing on this. Any suggestions for the curious? Are there any good ones? Are they particular oddities? Sorry, Anon, you're on your own on this one.